A synergistic blend of whole food herbs to help support the eyes. We use our eyes everyday for literally every task our body performs. This is why taking supplements for eye health is important before our later years. 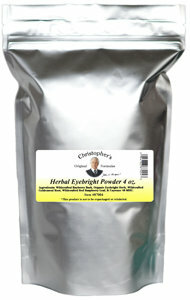 Dr. Christopher's Herbal Eye Formula Powder was designed to support optimal eye health. Also available in Capsule & Extract form.